The majority of this lesson is spent on giving students the opportunity and encouragement to read their Constitution in class. 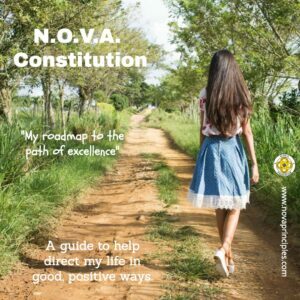 After every student has had the opportunity to read their Constitution, their N.O.V.A. instructor selects one student to read their Constitution at the N.O.V.A. Certification Program that will be held in the next week or two. The student’s N.O.V.A. instructor also chooses several students who did exceptionally well on their Constitutions who will receive a special Constitution Award at the Certification Program as well. Students are given a Certification Program invite to take home inviting their parents or guardians to attend the program. NOTE: Earning a Certification of Achievement Award from the N.O.V.A. Principles program is not an entitlement. Only students who complete all of the requirements that were explained to them at the beginning of the program as outlined on the N.O.V.A. Contract they signed are eligible to earn this special award. some or all of the following topics. a. Opportunities you want to take advantage of to help you become successful. b. Things you want to avoid. d. How the N.O.V.A. program has helped lead you to your path of excellence. We hope you take advantage of this opportunity and write your own N.O.V.A. Constitution!